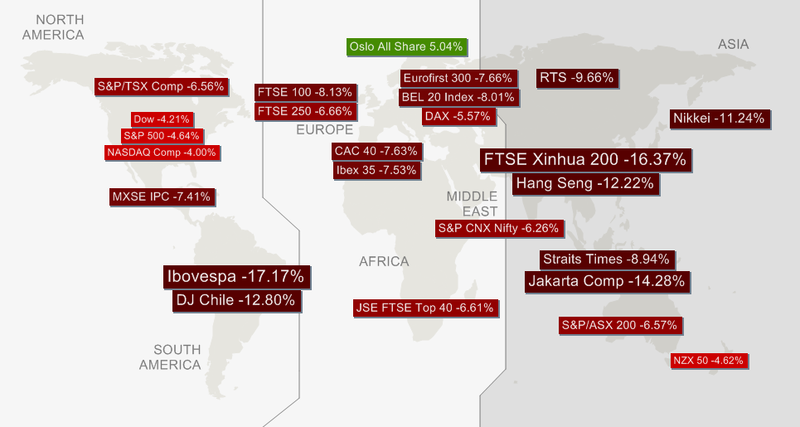 True enough equity markets have been somehow volatile over the last month and I have to admit that my equity view has been compromised on the sort term. That being said the moves that we have seen have nothing to do with a market dislocation and there are no medium/long term reason for me to change my view about an allocation shift and investors being about to formulate a preference for equity market as their favourite asset class for the next few years. This sudden investors twitchiness we probably can attribute to a combination of factors: Some degree of credit crunch engineered by the Chinese authorities to slow down speculators. The expectation of Bernanke ending the overly easy monetary policy conducted by the FOMC. The significant pull out of the bond markets triggering some risk aversion and funding need and therefore take profit on long equity positions to finance losses. Similarly a rebalancing of large funds since their bond/equity mix will have been affected by the fall in the bond valuations. I have to say however that overall I am at loss as of why this market reaction…clearly if the central bank are thinking about taking back some of the liquidity they supplied to the markets this means without any doubt that things are getting better out there. Also if one dissect Bernanke recent statement, he has made it quite clear that the FOMC decision will be driven by the economic data. So the ease of the monetary policy is there to stay with us for quite a while he is not about to hit the brakes but rather release pressure on the accelerator pedal as he put it. Anyhow in those times of market irrationality I like to look at some of my risk indicators described in: Is it Armageddon yet ? 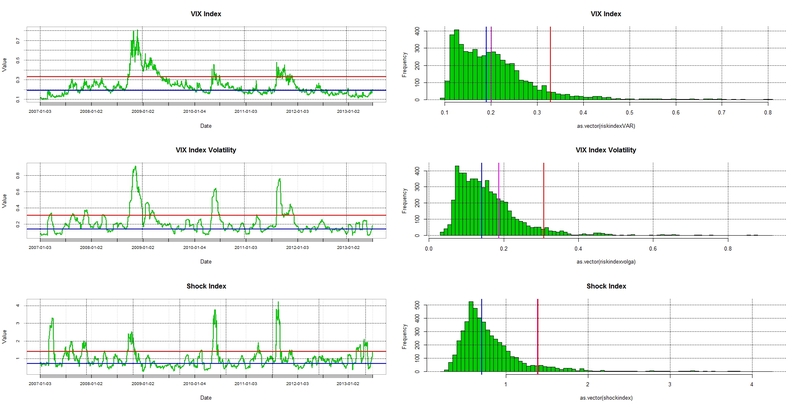 The VIX seems to have remained close to its long term median, its own volatility was muted and my ShockIndex, a ratio of the VIX volatility divided by the VIX level 21 days earlier tell us that indeed we have seem some degree of upside acceleration in risk levels but nothing that can be classified as a market dislocation. Now the question is how long is that market jitteriness supposed to last ? In trying to answer that question I find it useful to use a 2 states Markov Regime Switching model using the VIX as an input. The MRS establishes a transitional probability matrix to give us an idea of which state we are in, its duration and likelihood to go into the other state. The results are shown below. The first chart shows that we have been in a “Risk off” state” since the close of the 7th of June. The model also tells us the typical duration of this Risk off regime should be about 11 days. Bearing in mind that we have already seen 10 market sessions in the “Risk off” state, more joyful time should come our way…. 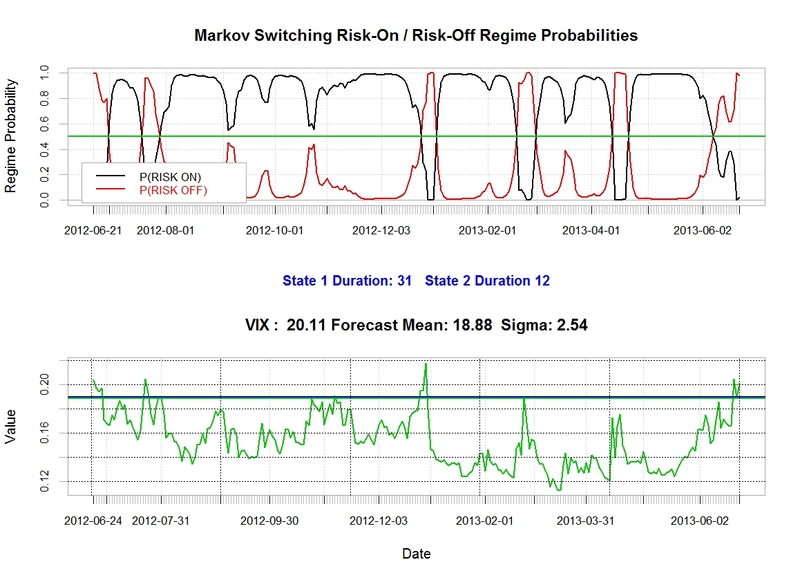 The second chart in the above panel shows the VIX and a forecast for the next day. Based on a close of 20.11 on the 24th we should expect the VIX to drop back by about 1.2 points during todays session…..which would be consistent with an up session in the S&P500…..
Posted in Stock Market on June 25, 2013 by Pierre.